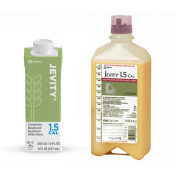 The Jevity 1.2 Cal High Protein Nutrition Drink by Abbott Nutrition is an ideal primary or secondary supplement for individuals who need concentrated calories, increased amounts of protein, and dietary fiber for enteral feeding. With 1.2 calories per milliliter, the Jevity 1.2 high protein drink with fiber will help children and adults maintain or gain weight. 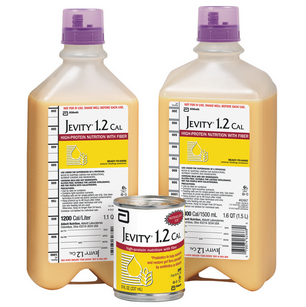 The Jevity 1.2 Cal can be ingested orally with the 8 oz. Ready-to-Drink Tetra Carton or the 1000 or 1500 mL Ready-to-Hang Container for tube feeding and can be used as a primary source of nutrition or as a secondary supplement. Caregivers and users are to follow proper enteral feeding instructions to reduce the potential for microbial contamination. This nutrition drink with fiber will be the perfect way to ensure that an individual with specific dietary needs receives the nutrition necessary to maintain a healthy weight and get the vitamins and minerals they need. The ingredients found in Jevity 1.2 Cal include the recommended daily intake for 24 different vitamins and minerals. One liter has 18 grams of dietary fiber with 8 grams of NutraFlora® scFOS® and 10 grams of a fiber mixture with both soluble and insoluble fiber. The 18 grams of fiber fulfills the recommended daily fiber intake, which will help promote regular bowel movements. The probiotic scFOS® is included in the mixture to promote the growth of healthy bacteria that will be beneficial for the colon and help restore gut flora. The nutritional information states that the drink is dairy and gluten free and will be compatible for people with lactose or gluten intolerance. It is also meets standards for Kosher and Halal. The Jevity 1.2 Cal High Protein Drink is available in a variety of sizes and cases. The 8 oz tetra carton is available for purchase individually or in a case of 24 or bulk case of 72. The 1000 or 1500 mL Ready-to-Hang Container, designed for tube feeding, is available in 1000 mL for purchase individually or in a case of eight. The 1500 mL containers can be purchased individually or in a case of six. Not Suitable for Individuals with Galactosemia. Not Suitable for Individuals with Soy Allergy. Water, Corn Maltodextrin, Corn Syrup Solids, Sodium & Calcium Caseinates, Soy Protein Isolate, Canola Oil, Corn Oil, Fructooligosaccharides, Medium-Chain Triglycerides, Soy Fiber, Oat Fiber, Calcium Phosphate, Magnesium Phosphate, Potassium Citrate, Gum Arabic, Soy Lecithin, Potassium Chloride, Carboxymethylcellulose, Sodium Chloride, Ascorbic Acid, Choline Chloride, Sodium Citrate, L-Carnitine, Taurine, Zinc Sulfate, dl-Alpha-Tocopheryl Acetate, Ferrous Sulfate, Niacinamide, Calcium Pantothenate, Manganese Sulfate, Cupric Sulfate, Thiamine Chloride Hydrochloride, Pyridoxine Hydrochloride, Riboflavin, Beta-Carotene, Vitamin A Palmitate, Folic Acid, Biotin, Chromium Chloride, Sodium Molybdate, Potassium Iodide, Sodium Selenate, Phylloquinone, Cyanocobalamin, and Vitamin D3. Contains milk and soy ingredients. What is the intended difference between Jevity and Promote, both made by Abbott, and Jevity 1.2 and Promote High fiber high protein formula? 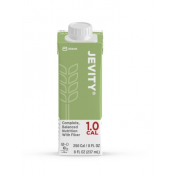 The Jevity 1.2 has a higher Calorie count per mL when compared to the Promote with Fiber. 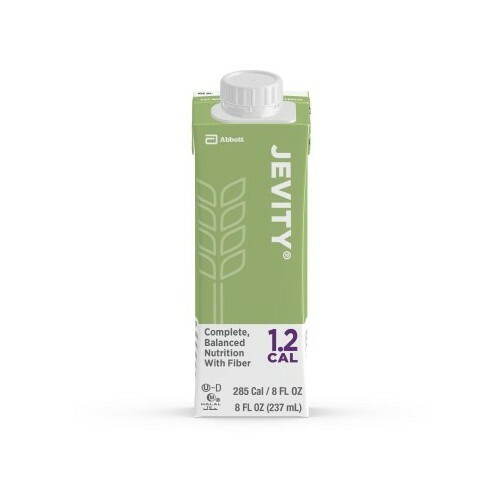 Promote offers 1 calorie/milliliter, Jevity offers 1.2. In total, an 8-ounce can of 1.2 yields approximately 284 total calories. The 1.0 will give you 236 total calories per 8-ounce serving size. I've tried this one but I don't like it that much. It makes me feel nauseous all day. I am switching to an organic enteral solution made from real food. I think this one has too much sugar and caseinate, which I would never eat on my own. Excellent. Delivery was speedy - within 2 days. Supplies well packed. Pricing excellent. My dad is on tube feedings and vitality medical has delivered quickly and efficiently. I ordered a case for my dad. Arrived quickly. Excellent nutrition to supplement oral diet. Needed this for my son, and it got here just on time. Normally I pay way more for this stuff, but this is cheap for me and shipped as advertised. Thank you!